Make sure to read the included readme.txt file on how to update this add-on with the 1.1 patch! Tired of Gear Manager bugging out? Being limited to very few slots for storing builds? Being forced to also store gear layout even though you use the same gear for multiple decks? Well, here's the solution: Deck Manager. Plain and simple it will allow you to save your own custom decks containing only your active and passive abilities. And there's no limit to how many you can create. Simply click the icon which sort of looks like some cards (not really, I will improve it) to the left of the compass and it will open up. The rest should make sense. Added preliminary support for augments. Fixed an issue with loading decks while some abilities were on cooldown. Please read all pre-release update notes as they contain important information about all the changes. Added support for the whip aux weapon. The group dropdown now works properly in the "Save New Deck" and "Import Deck" windows. Icon (when not using Topbar Information Overload) should no longer disappear in some cases. Collapsed groups now show the correct deck count when searching. You can no longer make enter mess up the search field. “Remove From Group” added to the group popup menu. The currently selected group for the deck is now highlighted in the group popup menu. The group popup will also highlight the selected deck. Only one popup menu should be visible at a time now. Group dropdown added to the save/edit and import deck dialogs. Favourite popup menu now lists 24 decks before adding a scrollbar (this will become an option later on). Fixed issue when saving new decks with no alias during the same session. Some corrections done to the data set to make sure everything is in order. The backup/restore functionality has not been updated to include groups and deck aliases. Weapon ID’s aren’t saved either, however these will get generated automatically when you restore a backup and reload the UI (meaning if you’ve switched the weapon order that will have to be re-done). Group functionality is missing from the add/edit dialog, so the only way to deal with groups right now is through Shift + right click on the decks. You can’t remove a deck from a group currently. Make sure you install the new script file if you want to use the slash command (remember this can now be used to switch decks). There might be a quirk with the “check if your deck matches current equipped abilities” where it sometimes gets confused. I didn’t get a chance to track that down yet. Assigning groups is done through Shift + right-clicking a deck. Groups can be edited by right-clicking them (the two default groups (“Unassigned” and “Quick Save Decks” can not though). Shift + your Ability Wheel hotkey will open/close Deck Manager. Ctrl + your Ability Wheel hotkey will open the favourites popup menu at your mouse cursor location. Right-clicking the Deck Manager icon will open the favourites popup menu. Shift + right-clicking the Deck Manager icon will open the deck popup menu (same as right-clicking it in the list). 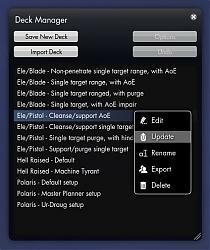 Ctrl + right-clicking the Deck Manager icon will clear the template, if you’ve set one through Deck Manager (this needs to be done to be able to go back to the TSW deck templates). 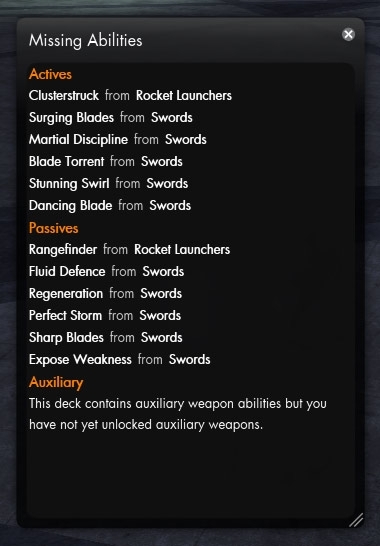 Ctrl + right-clicking a deck in the list will switch the order of the first two weapons as shown in the list. Favouriting a deck is done by clicking the star icon at the far right in the list for the deck. Same is done to un-favourite it. The /vdm slash command can open/close Deck Manager, or if followed by a valid deck ID or alias it will load that deck. Both deck aliases and searching is not case sensitive. Holding down Shift while loading/saving/updating a deck will omit aux weapons from the action – this works everywhere (although I have not fully tested it on everything yet). This list shows all the changes that has happened since 1.2.4 up to pre-release version 12. Fixed a few window size quirks – should make more sense/work better now. Fixed issue with recognizing the Chainsaw. Fixed some errors with data handling and the undo stack. Fixed a conversion error when updating from the old data format. Fixed issue with changing characters and not getting proper data loaded. Fixed issue with long lists and the deck list window resetting its position. The Missing Abilities window no longer has aspirations to grow bigger. Changed icon to be free-floating (can be moved and scaled) for users not using Topbar Information Overload. Corrected typo in “Assault Rifles” in Missing Abilities window. Changed “Swords” to “Blades” in Missing Abilities window. Changed “Blood” to “Blood Magic” in Missing Abilities window. Popup menus will not render outside the screen. Reduced the overall size of the popup menu for decks. Removed “Cancel” buttons from the Save/Edit and Import Deck windows. They were redundant (you can close with Esc or the close button) and I needed the space. The button in the Import Deck window is now for previewing the deck. Increased comment size to 800 characters. Changed all textfield behaviour in the different dialog windows to overall act better. Removed some character restrictions in the input fields. Changed rename to open a dialog box instead of doing it inline in the list. This was basically done to save me a lot of headache with the inline renaming caused by filtering and what not. 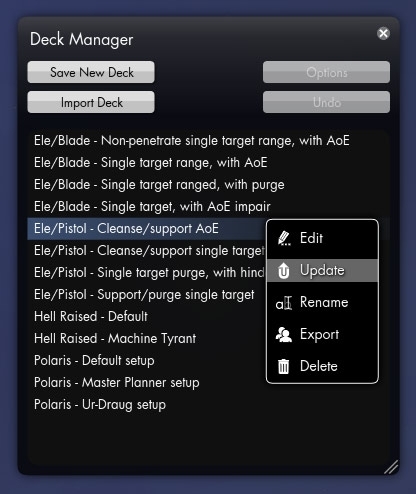 Added a new right-click popup menu for the icon allowing you to quickly save a new deck and change to favourited decks. The “Quick Save New Deck” option will save your current ability setup to a special group with default values for later editing. You can open/close the favourites popup menu by holding down Ctrl while using the Ability Wheel hotkey – it will open at the location of your mouse cursor. You can click abilities in the Missing Abilities window to open the Ability Wheel and go to that ability. You can set decks as templates within the Ability Wheel (like the normal game template decks you can gather). Ctrl + right-click the icon to remove the template again. You can preview a deck when doing an import and it will show up in the Ability Wheel like a template. Shows your currently equipped deck in the deck list, favourite popup menu and icon tooltip. In the lists it’s shown by a yellow highlight. You can open the popup menu for your currently equipped deck by Shift + right-clicking the icon. You can now open/close the Deck Manager window by holding down Shift while using the Ability Wheel hotkey. Missing Abilities now also shows aux abilities. Checks for abilities on cooldown and will not change deck if there’s abilities on cooldown. If the ability/abilities on cooldown are in the same bar position(s) as the deck you’re loading it will however load the deck as Deck Manager recognizes that they don’t need to be changed. 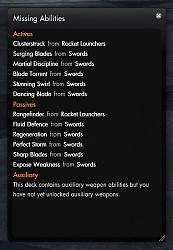 Shows the weapons required by the deck in the deck list. You can flip the order of the first two weapons by Ctrl + right-clicking in the deck in the deck list. You can now filter decks based on their weapons. Two filtering modes available for the weapon filter. You can favourite decks which will then show up in the new icon popup menu for quick access. Just mark it with a star and it’s favourited. Added copy feature to the popup menu for decks. You can do a text search in the deck list (not case sensitive). Press Alt (don’t hold it down) to focus the search field. You can load decks by using the /vdm slash command followed by the deck ID or your own alias (not case sensitive) for the deck. Warning when changing deck and you don’t have the correct weapons equipped. A second check is performed 12 seconds after you load the deck. - Check if deck matches current abilities. Shows a message in the tooltip and the active deck gets a redish background bar instead of yellow in the deck list and popup menu if it doesn’t match. - Holding down Shift while loading, updating, saving or importing will not load/update/save aux abilities. Added support for the new Quantum Brace weapon introduced in 1.5. Window will no longer grow on its own and can't get bigger than the screen resolution (well it can, it will just get its size reset the next time its opened). New backup/restore feature (where the disabled options button used to be). This will allow you to get a complete chunk of text for all your decks, to store in a document on your computer, in case the preferences gets reset and you lose your decks. There's no real checks in the restore function, but you can't do a restore unless you actually haven't got any decks (just a slight precausion). Fixed the error that caused the missing aux weapon to show for builds without any aux abilities in them. Fixed so "Edit" no longer saves the abilities as well, but only name and comment. Fixed keyboard input getting messed up after having opened windows with input fields in them (seems to be a problem with the CLIK controls which apparently sort of stay active despite not being so). Reverted to normal input fields - might make my own later. Fixed "Edit" not getting into the undo stack. Entirely new UI - it now fits with the TSW UI. You need to double-click a deck in the list to load it now. Added a context menu for decks by pressing right mouse button on a deck in the list. Window is now resizable, remembers its position and has a scrollbar. The list sorts alphabetically now. Undo button added to allow you to undo different actions. It's now possible to update a deck's abilities with your current ones. Added ability to add comments for decks. These will show up in tooltips when hovering over a deck in the list. Shows FIFO status messages about what's going on. It will no longer try to equip abilities you don't have. Instead a window is shown with a list of the abilities you're missing when you load it. Works with patch 1.2 and Auxiliary weapon abilities. When patch 1.2 hits it will still be able to import pre-1.2 decks. Entirely new data structure for storing the decks which is ready for the coming features I plan on adding. Your old decks are converted automatically to this new data structure. Should hopefully better hook onto the compass now. Now suports the Topbar Information Overload Add-on Manager. Please note: If you use this together with the new Add-on Manager in Topbar Information Overload you will have to slot the icon into position before it shows up. You do this through the Add-on Manager by Shift + clicking Deck Manager in the list and assigning it a slot. Possible to open the settings window using the /vdm slash command (assuming you also install the script - check the readme.txt). Icon now waits for the compass to show up before trying to hook itself to it, which should solve icons hiding under the Menu button. Replaced "Cancel" buttons with a close button in the upper right corner of the windows. Shift + click on a build will instantly load it, otherwise the options window gets displayed. Today when I imported a deck from a builder that someone had made, from which my character has some but not all of the abilities, two abilities that I DO have still show up in the Missing Abilities window, and will not equip unless I do it manually. I don't know if it's an issue with the vdm string generated by the build site, or the mod. Edit: This seems to just be happening when I import builds from thesecretsandbox.com, so I guess it has to do with how that site handles the build code generation. Alright, sounds funky - I'll investigate the issue. Could you possibly link one build that gives you trouble? There is only the name but nothing in that window.... Anyone got ideas? EDIT 1: By testing I notice that this addon does not work with Damage Meter. Any ideas why? EDIT 2: Then I tested Damage panel and it also breaks this addon. The empty window is something I've seen reported by others as well and it doesn't make much sense that it's happening to some people. I've tried various things to fix it, but so far nothing seems to have worked... The real problem is that I don't get that issue, so it's really hard for me to debug and fix. But I still have a few things I want to try and hopefully one of them will solve it. A workaroud should be to reload the UI (/reloadui or Ctrl + Shift + F1) and then it *should* open correctly. Last edited by Viper : 09-21-2012 at 10:42 AM. How do I update the addon without losing all my decks? There is a file 'charprefs.xml' , don't overwrite that file when updating. That file has nothing to do with the save decks. There is however a bug in the game client which can cause loss of data for some reason. Updating the add-on does not interfere with the saved data. Was just wondering if you're updating it for the extra 2 slots we got in digging deeper. has viper stopped updating this? Nope, the latest version fully works with 1.2 - it was updated and tested on TL before 1.2 hit. Last edited by OneMember : 09-07-2012 at 04:45 PM. Love this mod, especially the latest update. One of the best available for TSW, for sure. Thanks for taking the time to make this as well as your others, I use em all! Last edited by Dungeoness : 09-05-2012 at 08:25 AM. Hello, i would like to request a way to backup the decks. Just a button to display a list of all the decks would be nice. So i'm able to copy/paste it somewhere save. Thanks for the nice addon btw. Great addon, that I've been using for a long time. Downloaded and installed 1.2 today, and I particularly like the update feature. But I'm getting an error: I can't seem to save a new deck. When I press the "Save New Deck" button, I get a separate in-game box, with the words "Save New De" visible on the menu bar. I can move this box, but I can't resize it, and there are no contents to it. I can also close it. But nothing seems to permit me to save a deck. FWIW, I'm using Viper's TopBar Information Overload and several other adds. I will go through a round of testing out whether this addon alone runs well without any of the others, but I wanted to post to see if there was a quick solution. Thanks again for your work, Viper. Sorry to report a bug. I updated Topbar Information Overload to 2.0.3, hoping that it would take care of the problem. Then I loaded Deck Manager alone, without loading Topbar. The window showed up just fine, but now I'm having a different bug. I can save a deck, but now Deck Manager appears to have taken over my "Enter" and "Shift" keys. If I type enter, and go into chat, then touch a shift key, my chat window loses focuses and nothing appears in that window. If I later hit "Enter", I get a message saying "Deck Manager: New deck saved successfully." Any text I typed before hitting enter now shows up as the name of a deck, no matter what. The only way I can get out of this cycle is to click anywhere on the screen. Everything functions normally, until I hit enter to go into chat. If I only type in lowercase in chat, no problem. But if I hit shift, chat loses focus, and I get a bunch of new gibberish names in Deck Manager. Please understand that in reinstalling, I completely exited TSW, not just /reloadui. Also, I thought that it might be some weird memory glitch in my computer. So I logged out and rebooted, and restarted everything, with just Deck Manager installed. No joy. I should add that, in the course of uninstalling and reinstalling, I lose all of my old stored decks. So now I have the work of recreating those. I'd love to be able to drag selections around to put them in order. Last edited by Disturbedm : 08-22-2012 at 10:03 AM.